Juvenile spondyloarthritis (also called juvenile spondyloarthropathies) comprises a heterogeneous group of conditions characterized by inflammation of the sacroiliac joints and of the spine, varied degrees of enthesitis and arthritis, association with HLA-B27 antigen, and disease onset before age 16, accounting for 15–20% of all forms of arthritis in skeletally immature patients. Even though classification of juvenile spondyloarthritis is a controversial issue (which is beyond the scope of this chapter), this group of diseases classically encompasses juvenile ankylosing spondylitis, juvenile psoriatic arthritis, reactive arthritis, arthritis associated with inflammatory bowel disease, and the undifferentiated forms of spondyloarthritis. In addition to the axial skeleton, juvenile spondyloarthritis also affects the peripheral joints, mostly in the lower extremities, and prominent enthesopathy is often present. Peripheral arthritis and enthesitis of the lower extremities usually preponderate during the initial stage, and sacroiliitis and/or spondylitis are late findings, so that children with early-stage juvenile spondyloarthritis may be incorrectly diagnosed as having classic juvenile idiopathic arthritis. Radiographic criteria employed for adult-type disease are fairly insensitive for early diagnosis of juvenile spondyloarthritis, and, therefore, more sensitive imaging methods such as ultrasonography (US) and magnetic resonance imaging (MRI) have become increasingly important in this setting, given that early diagnosis and timely introduction of treatment are paramount for improved outcome and better quality of life. Pediatric collagen vascular disorders, on their turn, are multisystemic autoimmune diseases of uncertain etiology that are similar in many ways to their adult counterparts. Nonetheless, peculiarities in the presentation and evolution of the juvenile forms of collagen diseases make them unique, thus deserving separate study. Even though osteoarticular manifestations are not the more relevant in most patients, some imaging findings are quite typical, and it is important for the radiologist to be acquainted with them. Lin C, MacKenzie JD, Courtier JL, Gu JT, Milojevic D. Magnetic resonance imaging findings in juvenile spondyloarthropathy and effects of treatment observed on subsequent imaging. Pediatr Rheumatol Online J. 2014. https://doi.org/10.1186/1546-0096-12-25. Weiss PF, Chauvin NA, Roth J. Imaging in juvenile spondyloarthritis. Curr Rheumatol Rep. 2016. https://doi.org/10.1007/s11926-016-0624-6. Weiss PF, Xiao R, Brandon TG, Biko DM, Maksymowych WP, Lambert RG, et al. 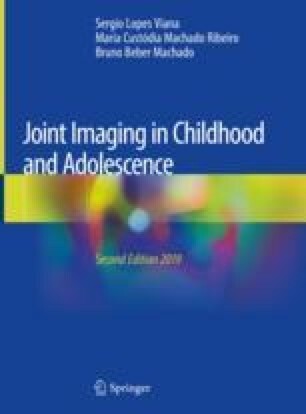 Radiographs in screening for sacroiliitis in children: what is the value? Arthritis Res Ther. 2018. https://doi.org/10.1186/s13075-018-1642-8.